A four bedroom town house offering on the ground floor the entrance hall leading to bedroom four, shower room, stairs to the first floor and a kitchen/diner overlooking the rear garden. The first floor has a 16ft lounge with sliding doors leading to the balcony and the master bedroom, the second floor completes the property with two bedrooms and a family bathroom. Stairs rising to the first floor, storage cupboard, radiator, triple built in storage, understairs storage cupboard, doors to shower room and kitchen/diner. A three piece suite comprising a shower cubicle, wash hand basin, low level w.c., tiled flooring, splash back tiling. Double glazed patio doors to rear, a range of storage cupboards at base and eye level, rolled edge work surface areas, splash back tiling, single drainer sink unit with mixer tap over, spaces for a washing machine, dishwasher and cooker. Stairs rising to second floor, doors to bedroom one and lounge. Double glazed window to rear, radiator, telephone point. 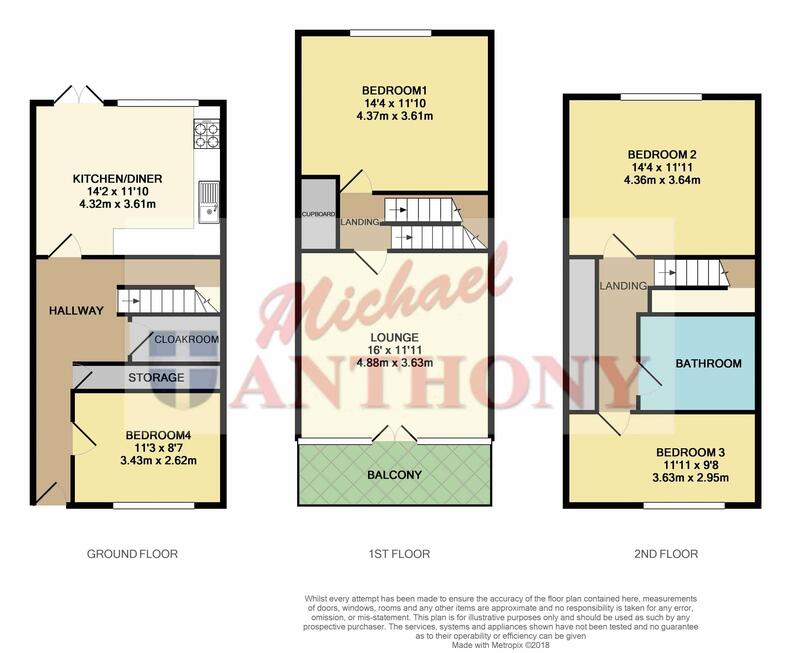 Double glazed doors leading to balcony, radiator, built in storage cupboard, television point. Doors to bedrooms two, three and bathroom, access to loft void, built in storage and airing cupboard. Double glazed window to front, radiator, built in storage unit. A three piece suite comprising an enclosed panelled bath with mixer tap and shower over, low level w.c., pedestal wash hand basin, part tiled walls, extractor fan, tiled flooring. Laid to lawn, pathway and gated access to rear.